Peter Geye’s charming essay about Micawber’s in St. Paul, Minnesota, pinpoints the beginning of his bibliomania to the purchase of a couple of Signet Classics in high school. “In the years between then and now, I’ve become a proper bibliophile ... There are many reasons I love books: for the worlds they show me, for the things they teach me, for the way they feel in my hand or in my satchel...” Francine Prose and Pete Hamill take turns reveling in the Strand’s 18 miles of books; Prose offers the intriguing tidbit that she often sells her used books and review copies to them. 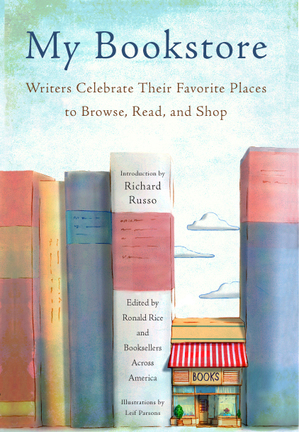 With an introduction by Richard Russo and whimsical line illustrations by Leif Parsons, My Bookstore offers some perspective on contemporary bookselling, and it is as much about writing as it is about bookselling. A common theme in the essays is the support a young writer finds in a community bookstore -- these are the stores that zealously promote author events, hand-sell first novels, even slip manuscripts to publishing insiders. Without these stores, where do readers go? And also, where do writers go? This endearing collection of essays provides a literary roadmap of the last great bricks-and-mortar bookstores in America -- now go! Peter Geye's charming essay about Micawber's in St. Paul, Minnesota, pinpoints the beginning of his bibliomania to the purchase of a couple of Signet Classics in high school. "In the years between then and now, I've become a proper bibliophile ... There are many reasons I love books: for the worlds they show me, for the things they teach me, for the way they feel in my hand or in my satchel..." Francine Prose and Pete Hamill take turns reveling in the Strand's 18 miles of books; Prose offers the intriguing tidbit that she often sells her used books and review copies to them.